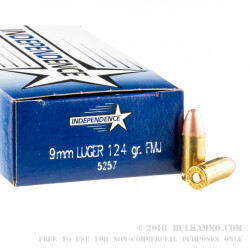 Independence Ammunition, a subsidiary to the same parent company as Speer and Federal, offers these 9mm Luger rounds as an inexpensive option for plinking and range practice! 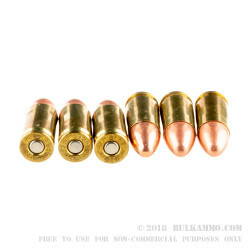 Each cartridge features a 124 grain full metal jacket (FMJ) projectile which evenly matches NATO loads as well as personal defense options for efficient training use. 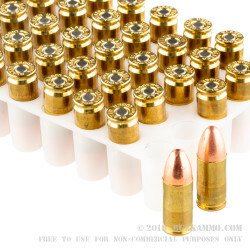 The bullet is housed by a reloadable brass casing which is fitted with a non-corrosive Boxer primer. With a muzzle velocity of 1,080 feet-per-second, this 9x19mm load can be expected to produce light recoil which is great for novice or handicap shooters who are being introduced to the caliber. 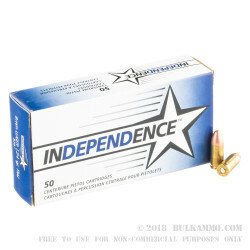 Independence ammunition is loaded in a few locations and utilizes the same top notch components as CCI and Federal brands. Q: Do these have any steel in the projectile, or steel core? I can't shoot anything like that at the indoor range I go to so it's important. A: Hello Jai, This Independence ammunition is loaded with a copper jacketed, lead core projectile and does not contain any steel.